Is NED University making progress to deal with the challenges of the 21st century? Is it competitive within Pakistan with other institutions of higher learning? How have NED University administration and faculty responded to the institution's low ranking by the HEC? How are the NED alumni faring in the real world? 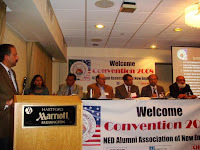 These are some of questions I explored at the NED Alumni Convention 2008 recently held at Hartford, CT.
As part of my effort to get answers, I participated in panel discussions at the Convention and followed up with Dr. Shamsul Haq, Mr. Jawaid Saeedi and others. I also drew upon my personal experience with NED alumni in Silicon Valley, CA. According to Dr. Farooq Rafiqi, the Dean of Civil Engineering who was a panelist at the Convention, NED Civil Engineering Department has been engaged in US government funded research projects and published research on earthquake disaster mitigation. Dr. Rafiqi also mentioned collaboration with UC Berkeley on some of the work being done at NEDUET's Cowasjee Earthquake Study Center. Dr. Shamsul Haq talked about how NED is trying to build a faculty to support expanded graduate programs and research. There are currently 50 PhDs on NED faculty and 50 more are expected to return from universities overseas in the next three years. According to NED Alumnus Jawaid Saeedi, Development Manager at Schlumberger in Texas, the PE Department within the faculty of Civil Engineering will graduate its first batch in December 2008. Mr. Saeedi believes that NEDUET has started with the right input from various experts. The members of the Advisory Board are capable of providing support to the department. This support could be in the form of establishing scholarships, chair(s) and funding for post-graduate education. With Professor Dr Khalid Aziz of Stanford University, a well known international expert in the area of Petroleum Engineering education, on the Advisory Board NED University PE department has the best resource. NEDUET does definitely lack the faculty members who could implement the proposed curriculum in its entirety. As an example one of the premier PE departments is in Istanbul Technical University. It has 11 PE PhD's on their faculty. Mr. Saeedi suggests that NED should use more industry resources to teach the required courses. Mr. Saeedi said that the department has provided field trips and seminars over the first four years of its existence. However, it needs to do much more in this area to stay up on the latest cutting-edge technology. That was one of the reasons Saeedi has proposed regular video conferences from North America. If a video conference is not possible, a NetMeeting session would be a good alternative to get NED alumni and other PE experts involved in improving education at the PE department. Dr. Shamsul Haq indicated that the PE department has good collaboration with petroleum industry in Pakistan, particularly Pakistan Petroleum Limited which has established a PPL chair at the university. Dr. Shamsul Haq talked about the HEC ranking process which relied on inaccurate and unaudited information provided by the institutions. In the case of NED, Dr. Haq said NEDUET took the position that the HEC as the funding body should not be ranking universities. NEDUET, therefore, did not respond to the HEC request for data. HEC used its own, unconfirmed data to assess NED's ranking. NEDUET disagrees with both the data used and the resulting ranking. Dr. Haq acknowledged that there are some issues in terms of faculty leadership and performance that have dogged some departments. Lack of initiative and absence of serious commitment have let the administration and students down and resulted in departures of faculty members. Dr. Haq did not elaborate on the specifics. However, he did indicate that serious alumni involvement and guidance can help alleviate some of these issues in the future. Looking at the worlds of high-technology, engineering, finance, journalism, writing, sports, music, politics or business, you will find NEDians making their mark. Among the sports personalities, you will find famous names such as cricketers Saeed Anwar and Rashid Latif, Asian games swimming medalist Asif Kausar, and national hockey player Hasan Sardar. Among the published authors we have Dr. Naveed Sherwani with a book on chip design and Imran Qureshi with a book on Cisco Internetworking, Ali Hasan Cemendtaur with several books to his credit, just to name a few. In the world of music and entertainment, you know and love NEDians Mohammad Ali Shehki, Ali Haider and actor Mazhar Ali who have made their presence felt. In the world of finance you have a recognizable NEDian Zakir Mahmood as the CEO of Habib Bank, one of the largest banks in Pakistan and Mohammad Aboobaker, former Intel executive and venture capitalist in Silicon Valley. In academia, we have Professor Ali Minai at University of Cincinnati, Dr. Jamshed Jami Shah at Arizona State University and Dr. Khalid Razzaqi at Illinois State and many more. It may come as a surprise to some of you that Arif Mansuri, the managing editor of Pakistan Link, is an NEDian. Last year, several young NEDians made their names as successful entrepreneurs in Silicon Valley. Of particular note are Raghib Hussain of Cavium which recently went public on NASDAQ, Naveed Sherwani of Open Silicon which is likely to go public soon, Rehan Jalil of Wichorus, a high-profile mobile WiMax start-up that has raised tens of millions of dollars in VC funding. These are just a few names from a long list of very successful NEDian businesses and executives found in the Valley. Other NED Alumni have had major impact in shaping this high-tech valley through their contributions at well known local companies such as Cisco Systems, Intel and Sun. Whether it is Intel CPUs, VIA chipsets, Sun Servers, Cavium Security processors, Cisco routers, Diebold or NCR ATMs, you will find NED Alumni fingerprints in creating these products and systems. So many of the advances in Chipset technology and Network Security Processors can be attributed to VIA and VP-Net; both these companies were co-founded by NEDians, Idris Kothari and Saeed Kazmi. Some of the VPNet alumni started Cavium. Earlier, Saeed, Idris and Zoaib Rangwalla served on the advisory board of another high-flying company called Exodus. Zoaib served as their first CFO. More recently, Idris and Saeed have a new company called Vertical Systems in the area of hospitality computing. In the field of manufacturing, there is NexLogic, founded by Zulki Khan, an NEDian. In the field of systems and software, away from the semiconductor tradition of Silicon Valley and highly successful without any venture funding, is Infonox (founded by Dr. Safwan Shah, an NEDian). Infonox is a market and technology leader in the delivery of complex financial services on Kiosks, ATM’s and other point of service devices. Each of these companies can boast of many fortune 500 customers and millions of users. Cumulatively, these companies and products have added economic value worth billions of dollars. Dr. Shamsul Haq said NEDUET is building an alumni network to improve contact and relationship with its alumni. He encouraged all alumni to register at the NED website. After four annual conventions of NED alumni in US and closer contact with NEDUET faculty and administration, the time is now right to begin a collaboration process between NEDians in North America and the NED University in Karachi. The first step is to sign up with NED Alumni Network and follow that up with specific, concrete proposals such as sponsoring lecture series, funding chairs at NEDUET, regular visits by alumni to offer seminars in their respective fields and arranging industry-academia links for NED University to work on specific projects or research.